Watching the pages fly into the HP Officejet Enterprise Color Flow X585z Multifunction Printer’s output tray at 26 pages per minute (text only) is impressive, being that we’re not used to such behavior from an inkjet, even an enterprise-class inkjet multifunction such as this. But in capacity, performance, and cost of operation, the $2799 X585z competes well with laser MFPs. It can’t quite match a laser printer’s text, but it out-duels the majority with its color graphics. 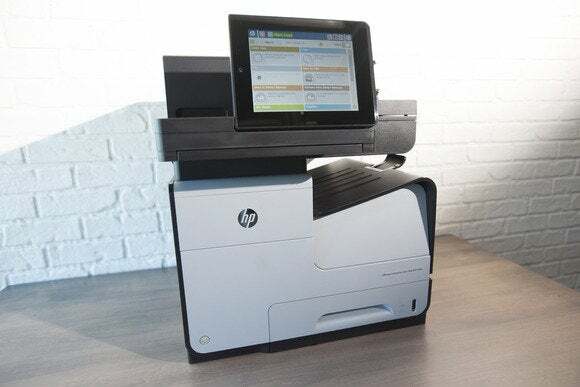 The HP Officejet Enterprise Color Flow X585z Multifunction Printer's scanner lid rises to reveal a legal-size platen. The USB/ethernet-attachable X585z proved just a hair finicky with on our test network. We had to reset our router and the X585z’s IP address to eliminate some rather lengthy pauses. Once it was up to speed, pages scooted out in rapid succession—22.75 pages per minute (ppm) on the PC and just over 16 ppm on the Mac. Why the large disparity between the PCL and Postscript drivers, we can’t say. Color photos print to plain paper at just over 4 per minute and a full-page photo printed to glossy stock takes about 50 seconds. 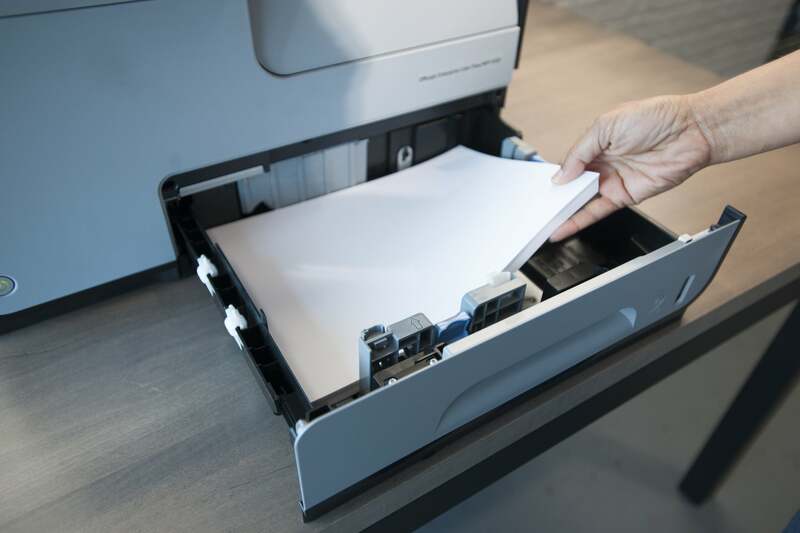 Copies are also quite fast, especially double-sided copies using the automatic document feeder, which has dual scanner elements to eliminate re-feeds. 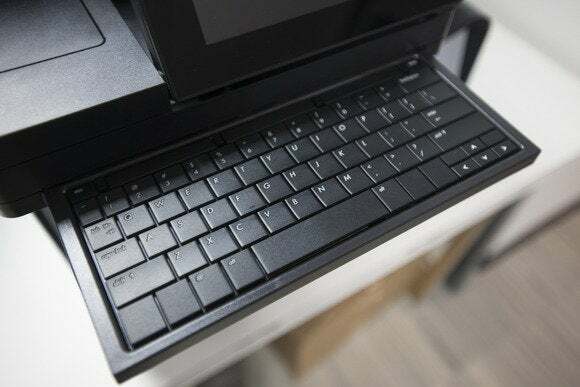 The secret to the X585z’s fast output is the PageWide print mechanism (introduced last year with the OfficeJet Pro x576dw) that covers the entire width of an 8.5-inch page. It’s actually a set of ten staggered print heads and in addition to faster prints, it eliminates alignment issues caused by shuttling a printhead back and forth on a carriage. 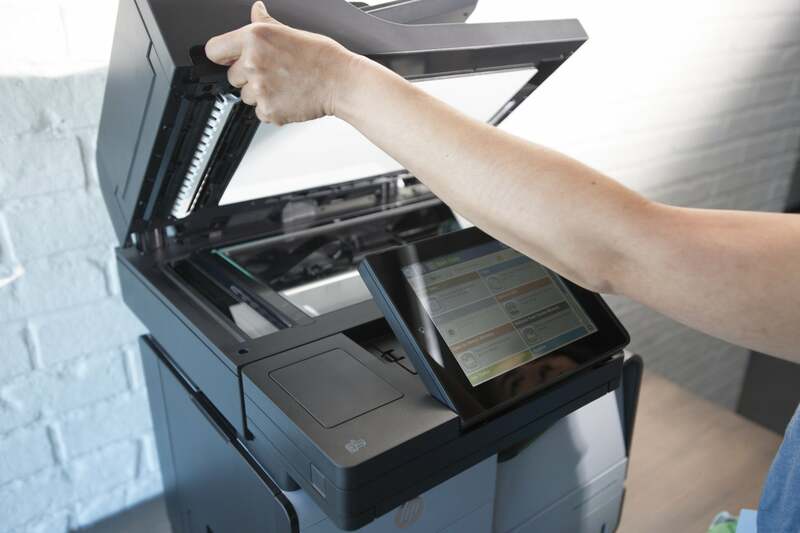 The HP Officejet Enterprise Color Flow X585z Multifunction Printer's input drawer takes 500 sheets. The X585z has plenty of paper capacity, starting with a 500-sheet bottom tray and ending with a whopping 300-sheet output tray. There’s also a 50-sheet multipurpose tray on the side of the unit for envelopes and the like. If 550 pages doesn’t cut it, you may purchase a 500-sheet auxiliary tray (B5L07A) for $300. The overall quality of the X585z’s output is quite good. Aside from some slight striations that cleared up after a 15-minute first-, and 5-minute second-level deep-cleaning (HP’s terminology), photos looked quite nice. Color graphics on plain paper at default settings looked a tad light, but are fine for the average business document. Text is sharp and clear for an inkjet, though not quite at the level that Epson has taken things with its PrecisionCore printheads. All in all, it’s typical HP inkjet, with a slight pinkish cast to skin tones, and an otherwise elegant palette. Open a door on the front of the HP Officejet Enterprise Color Flow X585z Multifunction Printer, and the ink cartridges rise for easy access. The X585z’s large 980 series cartridges make for outstandingly low per-page ink costs. Using online pricing from Staples, the 10,000-page black costs $114, or 1.14 cents per page. The cyan, magenta and yellow cartridges cost $98 and last for 6600 pages, or 1.5 cents per color, per page. That makes a four-color page a mere 5.64 cents per page. Also, there are no drums, waste catches, or other laser consumables to worry about. The X585z features a large 8-inch capacitive touch screen, and a slide-away keyboard (the z-model only) for controlling the unit locally. The whole deal is easy to use once you’re up to speed with the rather large array of functions. There’s a 320GB encrypted hard drive on board, so there are lots of things you can do with queues, previewing and storing scans, etc. Add secure printing, NFC, e-printing, multiple users, administrative tasks and the like, and a half-hour with the user guide will be time well spent. Me? I wing it, but that’s what I get paid for. A slideout keyboard makes data entry easy on the HP Officejet Enterprise Color Flow X585z Multifunction Printer. Other models include the $1999 X585dn, which lacks the Z’s keyboard, fax, and ultrasonic double-feed detection. The $2299 X585f offers the faxing missing from the DN. All models are recommended for 2000 to 6000 pages a month. If you simply want the speed and low cost of operation, you can get in the game considerably cheaper with the $799 X555 printer. The one area in which we weren’t particularly impressed with the X585z was one-year warranty. You can get up to five years, but you’ll pay over $1000 for it. As you’re already dropping a cool two-grand-plus, a one-year warranty, even if it includes onsite service, seems skimpy at best. The X585z’s feature set, quality graphics output, capacity, and speed render it highly competitive with similarly-priced, enterprise-class laser printers. Said laser printers may offer slightly better text, but rarely compete on photos or the X585z’s price for four-color pages. Well worth a look. 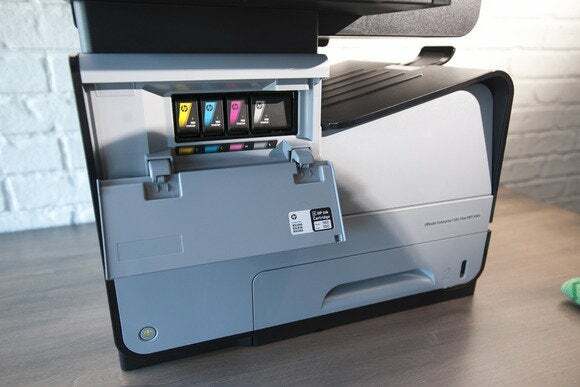 The HP Officejet Enterprise Color Flow X585z Multifunction Printer is one of the very few color inkjet printers than can give color lasers as run for their money. It's faster and cheaper to operate, and its print quality is very good, in fact, better than lasers when it comes to images. This enterprise-level model leaves very few things to chance. We were surprised by the skimpy one-year warranty, especially considering the price.